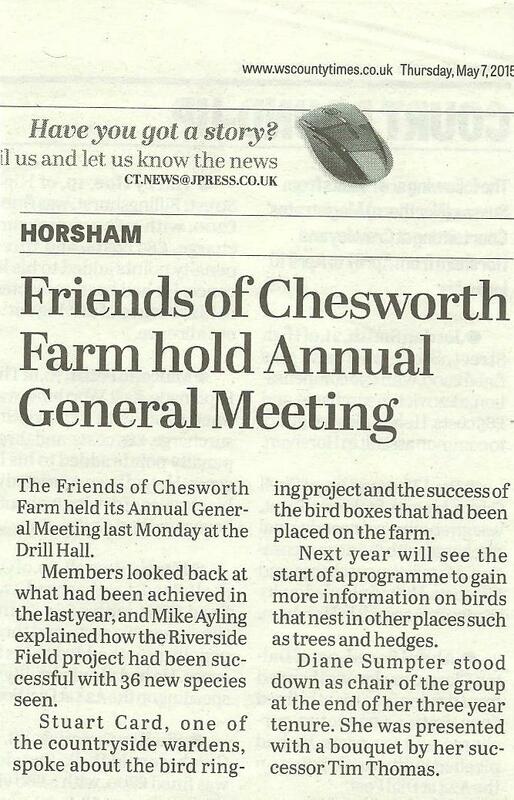 Over 50 people attended the Friends of Chesworth Farm’s recent AGM, a testament to the popularity of this much-loved and well-used local green space. The audience were given a short talk from Mike Ayling on the wetland project, which won the West Sussex County Times Friend of the Environment community award last year, and also on a bird ringing project by HDC countryside warden Stuart Card which is going to continue this year. The latest development, a dedicated dog splash, was mentioned and topics raised by the audience included how to improve bridleways and maintain grass verges in an environmentally-friendly way, and how to protect nesting skylarks. The committee asked all present to thank outgoing chair Diane Sumpter for her achievement in launching and developing the Friends group over the past three years and to welcome new chair, Tim Thomas. The group’s honorary president, Baroness Parminter of Godalming, concluded the meeting by thanking the committee and members for supporting and maintaining such a historic and biodiverse place for this and future generations. A report is featured in the West Sussex County Times, 7 May 2015, page 20.